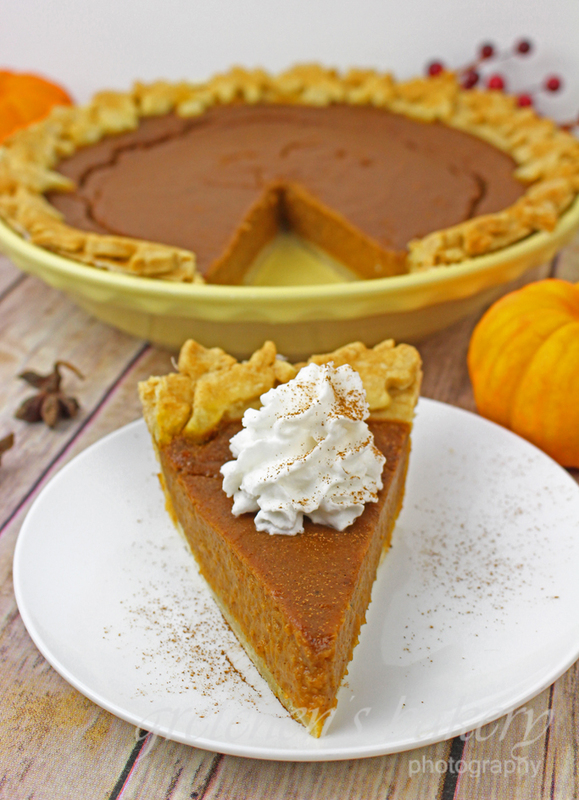 Everyone needs a vegan pumpkin pie recipe that passes the test from all our non vegan friends and family. The one dessert on the Thanksgiving Dessert Table that will be under much scrutiny is the Vegan Pumpkin Pie. We all have those friends and family members that are going to ” be the judge of that” when it comes to tasting out vegan creations. This recipe is a sure winner and I guarantee you no one will know! I’ve veganized my famous pumpkin pie from my bakery days where we just could not bake them fast enough from mid October through Thanksgiving. With a really easy pie crust recipe that is a cross between my vegan butter recipe and my mom’s oil crust recipe. 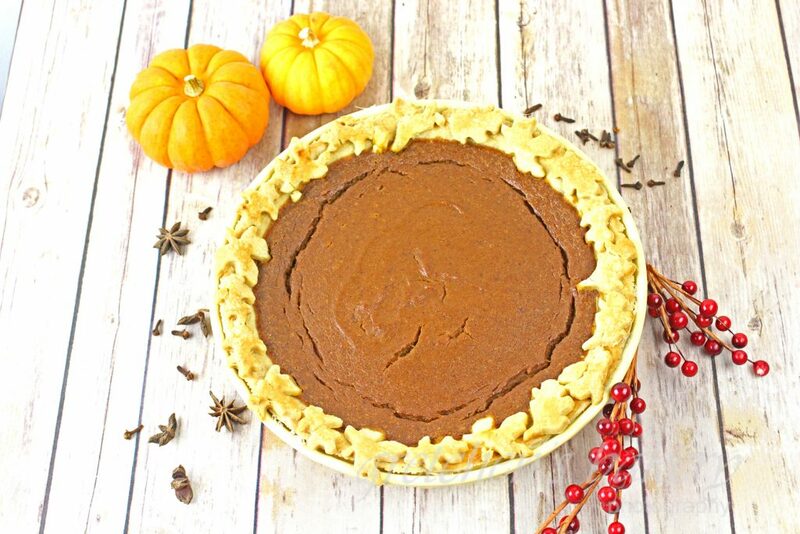 It’s basically got a little of both vegan butter and oil for a super flaky crust that can be the canvas for any pie you are making this season not just pumpkin! The pumpkin pie filling is sweetened with maple syrup and a little brown sugar and thickened with a blend of cornstarch and The Plant Based Egg Egg replacer. If you are not into using egg replacers or don’t want to buy The Plant Based egg, you can leave it out, or use another brand equal to 1 egg or nothing at all, just the cornstarch is fine but I do like the addition of the PBE here as it really gives it that authentic “egg binding” that the traditional pie offers. Using just the cornstarch as the binder alone will work just fine, but again I think the PBE adds a certain smoothness to the final custard. For the pie dough first get the vegan butter and shortening or coconut oil to the freezer while you measure the rest of the ingredients. Combine the flour, salt, sugar in a food processor (or you can mix the entire recipe by hand with a pastry cutter or fork) process to distribute the ingredients evenly. Add the cold vegan butter and the shortening or coconut oil and process until it is mealy and course crumbly texture. Add the cold water and the oil through the feed tube while pulsing and then process until a soft crumbly dough forms. Turn it out onto a lightly floured surface and gather the dough together to a soft ball that stays together. Wrap in plastic and refrigerate for an hour to relax the dough and allow the flour to absorb through. Once chilled, roll the dough on a lightly floured surface (this dough is much easier to roll between 2 pieces of parchment or wax paper) to about 12" diameter (¼" thick) and line your pie plate. 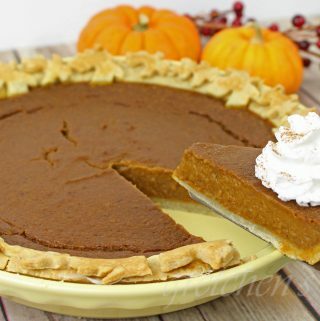 Trim the excess and re-roll to cut out the optional leave shapes to adorn the rim of the pie. For the pumpkin pie filling, combine all the ingredients together in a large mixing bowl and whisk smooth. Pour into the pie crust and bake in a preheated 350°F oven for 1 hour and 10 minutes. Remove from the oven, cool completely and then refrigerate to set before serving. Since I am not a fan of pumkin, I’m going to turn this into a sweet potato or honeynut squash pie. I’m excited! Your recipe looks really good. Can you tell me, what changes would you make for a speculoos cookie crust? Have you made it that way? Thank you for any help. 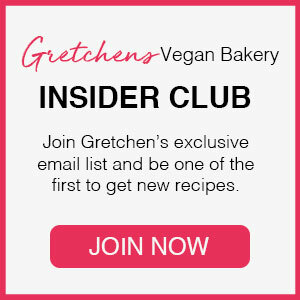 What exactly does the Plant Based Egg do in baked goods? Flax or Chia will/won’t do the same thing? 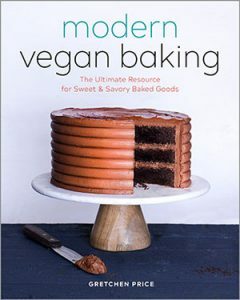 In my experience using all the egg replacers (including in a controlled test of one recipe with 8 different replacers her in my online course Vegan Baking mastery) I have found that the Plant Based Egg is my favorite. In my opinion flax can be gummy, and because of the fat content I feel it almost weighs down in the final recipe. The Plant Based Egg ingredients are psyllium husk, flaxseed, pectin (apple/citrus pectin and cane sugar), agar, milled chia, and sunflower lecithin. It is gluten and top 8 allergen free and made in a dedicated facility. Unfortunately the website isn’t up yet, and Amazon has required us to sell by the 3-pack grrr… but once the website is done we can ship single packs out! First of all, this was more delicious than any pie I remember eating from the store in my non-vegan years, or any pie my mom tried to make around the holidays. I made this for a vegan bake sale and I didn’t get to take any home with me–it was such a big hit. Having grappled with this as a college student owning very little equipment, however, I would like to offer a few tips about the crust and achieving a very good-looking pie. I chose to make this with vegan butter, sunflower oil, and coconut oil instead of shortening. I mixed everything by hand and cut the oil into the flour with a fork. If you go for this route as well, I do not recommend making your coconut oil very cold before adding it to the flour. The first time I tried this, I ended up with huge, hard chunks of coconut oil in the dough, which I couldn’t easily break up and didn’t think to remove, because I’m not that experienced a baker. That was a very big mistake. If you leave these hard chunks of oil in the dough, baking it will cause the oil to melt, leaving big holes in your crust where the chunks were and causing the whole thing to collapse. I had to remake my crust, and this time I was very careful to remove those hard chunks of oil as I came across them while rolling it out. That time I was successful–my crust held its shape through blind baking instead of slumping down the sides. Learn from my mistake–keep your coconut oil solid, but don’t let any hard chunks of it stick around! Hi Kaitlyn! Thank you for the feedback! I appreciate that! Can you substitute soy or flax milk for almond milk? Thank you! We don’t have tinned Pumpkin in the UK. But we have plenty of fresh pumpkin. What do i need to do to the fresh pumpkin to get it to tinned pumpkin status? Or can I just grate it finely?